We all know that we try our best to stay sanitary when having to visit bathrooms in public places. One of the main ways of protecting yourself from germs and other harmful bacteria is by using protective toilet seat covers. When our toilet seat covers are used, you will be completely satisfied with the lower risk of exposure to others’ germs and bodily fluids to your customers. Our products guarantee a better outcome and experience for both the users of your public bathroom and your company. We are an American-based company that specializes in the production of toilet seat covers that are sanitary and dependable. Our company has been able to provide our sanitary toilet seat cover systems to thousands of different locations. We consider ourselves to provide the absolute best public restroom toilet seat covers in the industry. As an American-based manufacturer, we are the only company to offer our clients a highly technological, hands-free toilet seat cover system and sanitary plastic. Being aware that the need to utilize a public restroom has the potential of being an unpleasant experience, we know that you take sanitary toilet conditions very seriously. Our goal is to aid every client when it comes to bathroom cleanliness by providing the highest quality of product. Due to our innovativeness and reliability, we have become one of the leading providers of toilet seat covers that are sanitary and of great quality. The commitment we have to continuously improving our products and providing the best to our consumers has enabled us to have a wide variety of trusting customers. We have been able to provide protective toilet seat covers to country clubs, schools, factories and even hospitals all over the world. Our company is able to manufacture a variety of bulk paper toilet seat covers that will continue to help you to provide a public bathroom that is relatively free of potentially dangerous germs and diseases. For this, we have been able to design a hand-free, electronic toilet seat that automatically changes and covers the toilet seat with a protective covering. With one hand wave in front of a wall mounted sensor, sanitary paper toilet seat covers are ejected and set in place for every user. This is one of our proudest achievements, as we are able to aid our clients with the ability to further protect their customers and employees. By using our touch free products, we are able to provide an extra guard against any accidental exposure to germs that may happen when users need to touch the toilet or seat. In addition to providing a more risk-free environment for public bathroom users, our products also provide an opportunity for you – our consumers – to reduce the costs of maintenance. The option of our automatic toilet seat covers ensure that a mess of toilet seat products will not ensue in between maintenance times. This allows for you and your clients to thoroughly enjoy and appreciate having access to a clean bathroom facility. Many of you realize that the cleanliness of their public bathroom can have the potential to make or break their business. Our revolutionary toilet seat cover technology is guaranteed to help your business maintain great hygiene for all customers. By preventing the spread of germs, cutting down on the spread of illnesses and helping safeguard public health, our protective toilet seat covers are a great investment for any and all companies! Outside of the workplace, we all love opportunities to go spend the day or entire weekend out and about. Whether that is at a sporting event or at a local museum, using a crowded and very public bathroom can cause anxiety for anyone. The idea of having to use a busy and possibly unsanitary public bathroom is definitely cringe-worthy, but our company is able to provide you with the best public restroom toilet seat covers. Though our automatic, hands-free toilet seat cover dispenser is recommended to you, we also offer the option of disposable toilet seat covers, which are sanitary and available for wholesale. Our company uses high quality materials in order to provide the best possible products you. Though we are able to provide such a high quality product, we are also providing cheap public bathroom toilet seat covers since we manufacture all of our own materials. 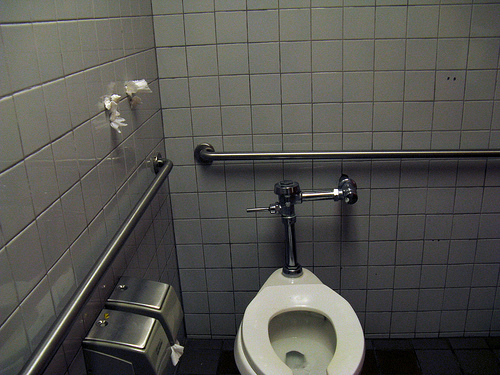 Our main goal is to always provide the best public toilet covers for our customers. We want to help your company gain and maintain a reputation of excellency; just as we have for over 25 years. All Brill Products including the Brill Seats and Brill Sanitary Plastic Toilet Seat Covers are made in the USA using prime steel and high strength engineered plastics. We are proud to be an American employer of all genders, races and ethnicities. Brill Hygienic Products is famous for quality, service and reliability and we are proud to contribute to the American economy. ©2017 BRiLL Hygienic Products, Inc, all rights reserved.